Born on 21 February 1949 in Landau/Palatine, died of a heart attack in Berlin 3 February 2016; contrabass clarinet, bass clarinet, sopranino saxophone. Wolfgang Fuchs' first musical instruments, at the age of nine, were violin and mandolin but, during his studies at the Music Academy of Karlsruhe between 1969 and 1974 he studied saxophone and clarinet. Moving to Berlin in 1974 he has, since 1976, worked as freelance musician primarily in the area of freely-improvised music but also in a wide range of mixed-media projects featuring music and other arts. 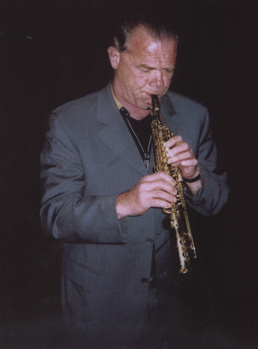 Over the years, he has played with a large number and variety of musicians including Fred van Hove and Peter Hollinger or Paul Lytton in Berliner Begegnung (1983-1987), Paul Lytton and Mats Gustafsson (toured Sweden as a trio in 1994), Philipp Wachsmann and Paul Lytton (toured England as a trio in 1995), and Lingua (with Thomas Lehn and Fabrizio Spera, 2000). He has been a member of Butch Morris' Berlin Skyscrapers large group conduction (1995 and 1999) and a member of various Cecil Taylor projects including the 1986 European American Group, the 1990 Orchestra that appeared at Total Taylor Total, a 1991 Scandinavian tour featuring Taylor with Tony Oxley, Barry Guy and Harri Sjöström, and the 1999 Workshop Ensemble. In 1996 he was founder and leader of berlin factory, a workshop ensemble with young Berlin-based musicians which has since performed at Soundworkshop 97: Contemporary Music in Kreuzberg and performed Fuchs' composition Aqua libre at the festival Kryptonale IV in Berlin in 1998. Perhaps the most well-known, long-standing large group with which Fuchs has been associated is King Übü Örchestrü. He was founder of the tentet in 1983 and has been leader ever since with changes in personnel and size, regrouping periodically for concerts and recordings: a tour in Germany in 1989; a recorded performance in 1992 at the Akademie der Kunste, Berlin; appearance at Nickelsdorf Festival, Austria in 1995; a recording made at the Total Music Meeting in Berlin in 1998; and an extended performance with guest vocalists and narrators to mark the group's 20th anniversary at Total Music Meeting 2003. A spontaneous octet of some members of King Übü Örchestrü with other European improvisers and US musicians - Mount Washington from 2003 - works in a similar soundworld. Fuchs has also worked extensively over a long period with George Katzer, Hans Koch and Peter van Bergen. His first encounter and collaboration with Katzer occured in 1988 to be followed over the next few years with participation at the Electron-Music-Festival at Skinnskatteberg, Stockholm, in Innergerman Encounters at Rostock, Potsdam and in Katzer's multimedia project, Rooms, in Berlin, (all 1990); a trio performance with Hannes Bauer at Festival Syntèse in Bourges, France (1991); concerts at Villa Massimo, Rome in trio with Helmut Zapf (1996); a trio concert with Hannes Bauer at Festival Brandendburgische Kunsttage (1998); and a duo in Löbau, Scharoun-Villa in 2001. Katzer has also been a member of King Übü Örchestrü. The contrabass clarinet trio with Hans Koch and Peter van Bergen was formed in 1993 under the name Holz für Europa and has made almost two-yearly appearances since then. In the mid-1990s, Alexander von Schlippenbach was commissioned to provide new arrangements of eleven Eric Dolphy compositions, performed in 1997 by the trio as the Eric Dolphy Project. The trio undertook a concert tour of the Netherlands in 1999, played concerts in Switzerland and Germany in 2000, and toured the US, including a performance at the Empty Bottle Festival in Chicago, in 2001.
his close interest in painting is indicated by his regular use of the work of Max Neumann on his LP and CD covers. More recently, Wolfgang Fuchs has become involved in two new trios: Three October Meetings and The New Flags. Three October Meetings comprises Fuchs along with two young North American musicians: Damon Smith on double bass and Jerome Bryerton on percussion who first played together in 1997 during Fuchs solo tour of the US. They recorded the excellent CD which subsequently gave rise to their name in 2001 and have since toured the US west coast and Germany, playing important festivals in San Francsico, Berlin and Austria. The New Flags was formed in June 2002 with Xu Fengxia, guzheng, voice and Roger Turner, drumset; they appeared at Total Music Meeting in 2002. Wolfgang Fuchs has received a number of awards and grants, including a 3-month grant in 1996 from the Academy of Fine Arts, Berlin to be artist in residence at Villa Serpentara, Olevano Romano, Italy. From 2001, he has been artistic director of the Total Music Meeting in Berlin. 1983,	Berliner Begegnung,	FMP SAJ-47. 1983,	Frogman's view,	Uhlklang UK-5. Xpact. 1984,	Music is music is...,	Uhlklang UK-6. King Übü Orchestrü. 1985,	So - und? So!,	Uhlklang UK 7. 1985,	Vario, Moers Music 02048. 1986,	Wo der kopf sitzt,	FMP SAJ-56. Berliner Begegnung. 1987,	the Glider & the Grinder, Bead 25. Tony Oxley/Phil Wachsmann project. 1989,	Duets, dithyrambisch,	FMP CD19. Fuchs/Koch/Parker/Sclavis. 1989,	FinkFarker,	FMP CD26. Duo with Georg Katzer. 1990,	Melancholy,	FMP CD104. Cecil Taylor Workshop Ensemble. 1992,	Ohrkiste,	ITM Classics 950013. Radu Malfatti Ohrkiste. 1992,	Binaurality,	FMP CD49. King Übü Orchestrü. 1995,	Comité imaginaire,	FMP CD84. Holz Für Europa. 1995,	Butch Morris conducts Berlin Skyscraper '95,	FMP CD92/93. 1995,	Bits and pieces,	FMP OWN-90004. 1996,	Il grande quarto d'ora,	C.M.C. 9980-2. Giancarlo Locatelli/Franco Beltrametti. 2001,	Three October meetings,	Balance Point Acoustics bpa 003. Fuchs/Bryerton/Smith. 2002,	Live at the Total Music Meeting 2002, a/l/l 007. The New Flags. 2003,	Six Fuchs, Rastascan BRD052. 2003,	Noisy people, A film by Tim Perkis. Short sequence showing recording of Six Fuchs. 2003,	The Happymakers,	Balance Point Acoustics bpa 008. Fuchs/Lindsay/Smith/Baghdassarians/Baltschun. 2004,	Facetten: live at Total Music Meeting 2004, a/l/l 012. Van Hove/Fuchs duo. 2004,	Conductions 143/1 143/2, Galatina Records CD 0701. Butch Morris/Ensemble Laboratorio Novamusica.